Nachos. Na-chos. Even the word sounds stuff-it-in-your-mouth-able. Doesn't it? Sure, it isn't the healthiest meal you can whip up, but sometimes only a plate of crunchy tortilla chips drenched with toppings and gooey cheese will do the trick. The best part for me is that string of melted cheese when you pick up the first chip. And when you take that first crunchy-spicy-cheesy bite? Man you know that belly-bliss is not far off. Arrrrrriba! 1. Saute onion in olive oil until softened. Add mince and fry over medium-high heat until nicely browned. 2. Add spices, salt, pepper, tomatoes and sweet chilli sauce and cook for another few minutes until flavours are well developed and mince is saucy but not too wet. 3. Meanwhile make the guacamole - mash the avo, add fresh coriander and lemon juice and season to taste with salt & pepper. 4. 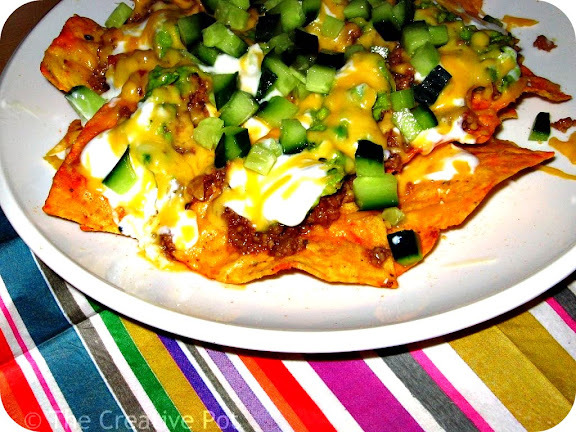 To assemble nachos, arrange tortilla chips on individual serving plates. Top with mince, then add dollops of guacamole and yoghurt. Scatter cheese on top and place in microwave for a minute to melt the cheese. Top with a handful of the cucumber pieces and serve warm. Thanks Karine! It was my first attempt at making them and I'm quite pleased with how they turned out.